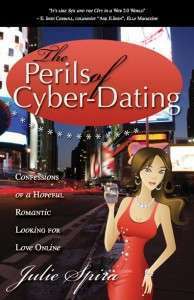 Julie Spira, author of the Amazon best-seller, The Perils of Cyber-Dating?will be a featured guest on the Cosmopolitan Radio program, Cosmolicious with Diana Falzone. Spira will be talking about her top ten rules of netiquette for online dating on the radio show which is heard on Sirius (channel 111) and XM (channel 162). The live interview will be held on Wednesday, May 20, 2009 at 3pm Eastern/12 noon Pacific on Cosmo Radio.